I recently went to a book store in Kensington Market and ventured over to the baking section to flip through some books to see if anything caught my eye. After some browsing I landed on one page that had jam filled shortbread ‘thumprint cookies’. I found that these cookies looked super cute (like buttons) and I just had to make some! I also found that they allowed for a lot of freedom in variation of flavours & styling. I decided to combine a couple different recipes and landed on creating an espresso shortbread cookie with a caramel sauce filling and chocolate drizzle on top. I was pleasantly surprised how easy they were to make! 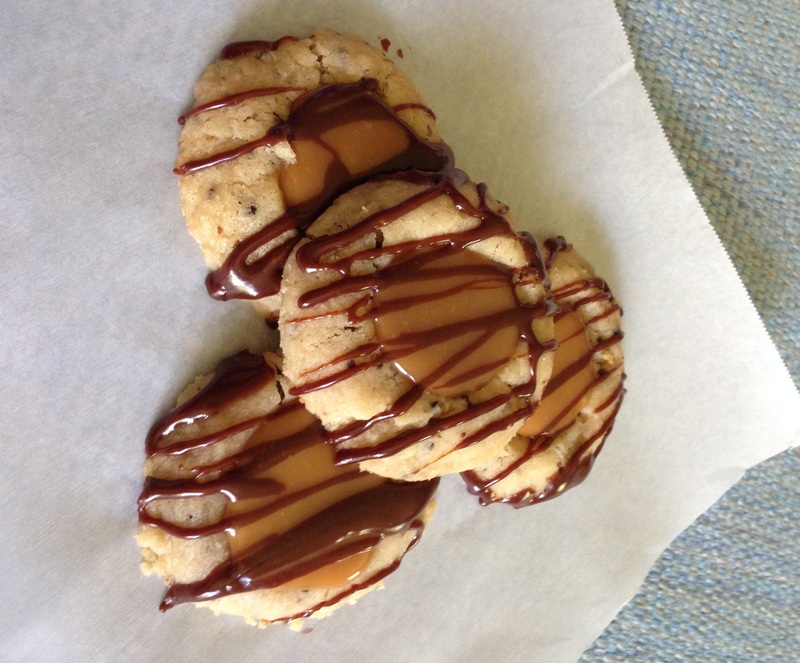 The saltiness in the shortbread cookies really complimented the caramel sauce and sweet chocolate flavour. I was too lazy to make my own caramel sauce from scratch, so I just bought some caramel squares and cream to make the filling sauce. These thumbprint cookies are a perfect size to snack on and would be a great treat to bring for a potluck! CREAM: together butter, granulated sugar and brown sugar until light and fluffy; stir in vanilla. COMBINE: together flour, espresso powder and salt; stir into butter mixture in 2 additions. Form wet & dry ingredients into a ball and knead 1 or 2 times until smooth. MAKING THE THUMBPRINT: Take 1 tsp and roll them into balls, placing them on parchment paper–lined baking sheets. Use your thumb to create a deep well into each cookie (the deeper the well is the more caramel you can fill in!). BAKE: for 15 to 18 minutes until pale golden. Let the cookies cool on the pan on top of a rack for 5 minutes. Then transfer to rack and let the cookies cool completely. 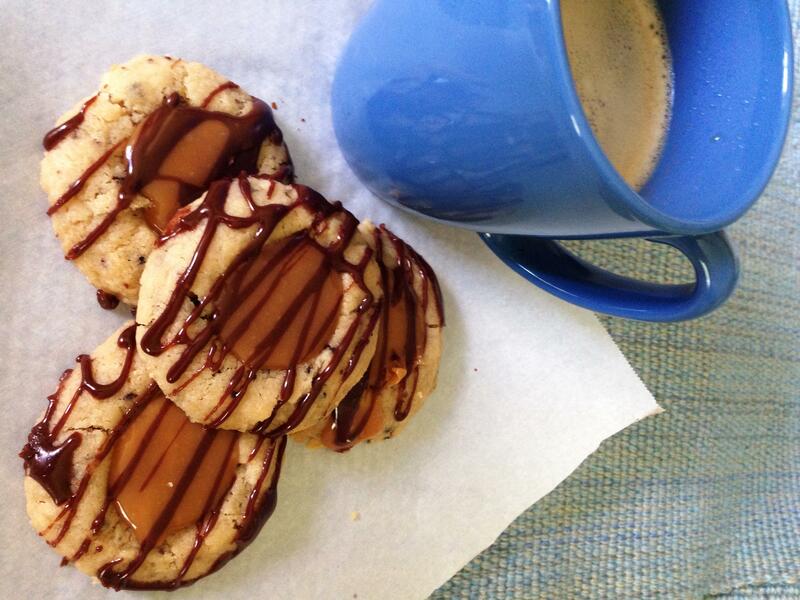 CARAMEL & CHOCOLATE SAUCE: while the cookies are cooling you can make your caramel & chocolate sauce. I chose to make the sauce over stove top, but you can also make it in the microwave. Take a pot and fill it with water – place on stove top on medium heat. Place a glass bowl on top of the pot and start unwrapping the caramel cubes into the bowl & the half and half cream. Melt until caramels are completely melted and mixture is well blended, make sure to stir frequently! 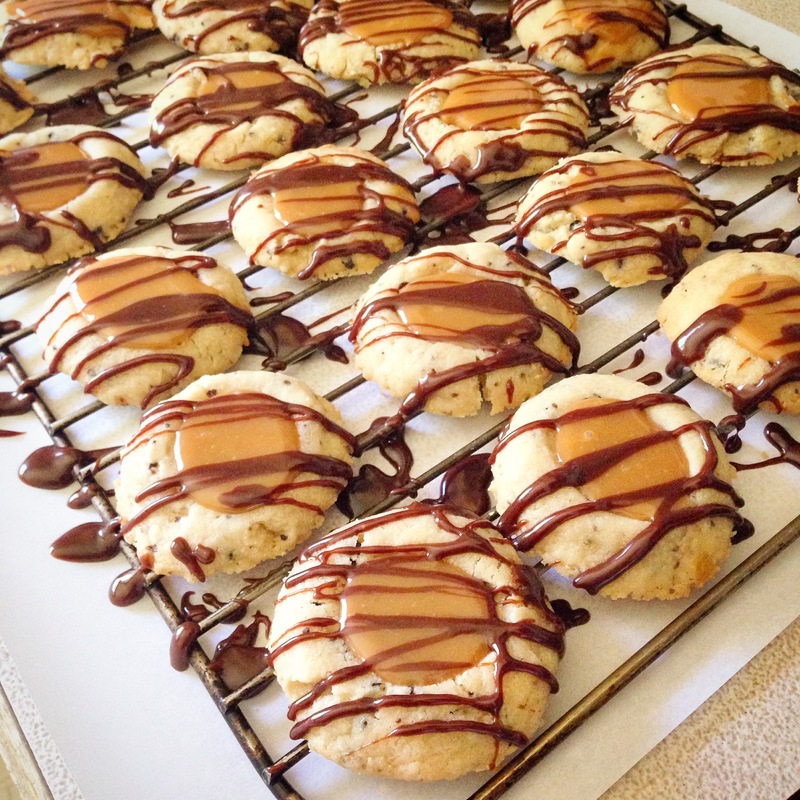 Once the cookies are cooled fill them with the caramel sauce and then melt the chocolate to drizzle on the cookies. Posted in Baking, CookiesTagged baking, chocolate, coffee, cookies, dessert, espresso, food, photography, recipes, salted caramel, shortbread, summerBookmark the permalink. These sound amazing! Thanks for visiting my blog and liking my recent post!